takes patience. It can take 2 to 3 years before you see any flowers and in the mean time, you have to remember to take extra care of the young plants. It’s a very inexpensive way to gain a lot of plants for your garden, but it does take time. When a plant does the hard work for you, it’s all the more welcome. These perennials self-sow, although not aggressively. Self-sown plants tend to be a bit hardier than seedlings we start ourselves and it’s very easy to lift these volunteers and move them to another spot in the garden. If you are looking for plants that will fill in gaps in your garden, plant a few of these. Bear's Breeches are considered architectural plants. In fact, the leaves were often used as a motif in columns and ornaments. The foliage is wonderful, but it’s the 3 ft. spikes of white flowers with their purple bracts makes them standouts. The 2 species most commonly grown are: Common bear's breeches (A. mollis), with wide, round leaves and Spiny bear's breeches (A. spinosus), which has more flowers and thistle-looking foliage - although it is not prickly. USDA Hardiness Zones 6 - 10. Full sun to partial shade. If you’re looking for an easy care plant, you can’t go wrong with the bellflowers. There are several species to choose from. Some are tall and upright, others hug the ground and spread out. They all have bell-shaped flowers, usually in white, purple or pink. Although they flower best in full sun, they do need regular water or even moist soil, to thrive. USDA Hardiness Zones 4 - 8. Full sun to partial shade. 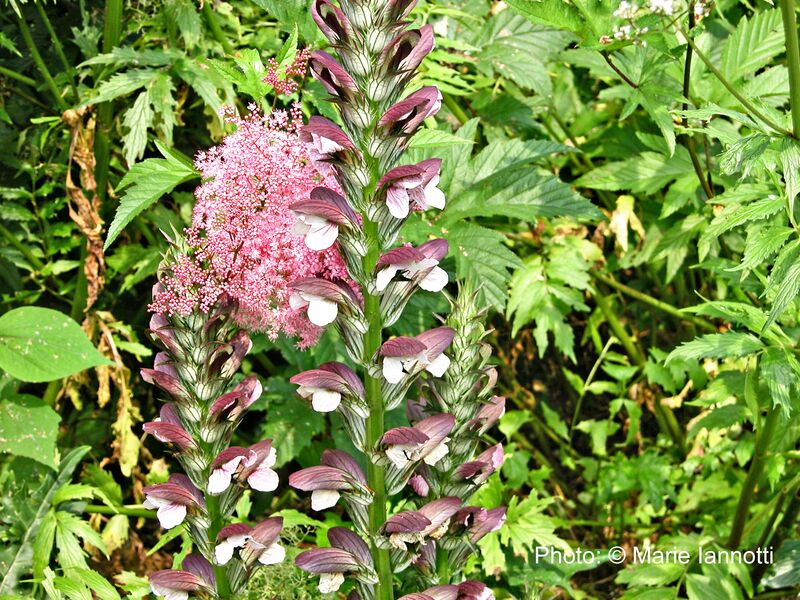 Blazing star is often sold as corms and you can purchase a bag of them fairly inexpensively. That’s a nice way to get started and then let them start re-seeding for even more. If you’re really impatient, you can even lift the plants and separate the smaller cormels from the main corm, and re-plant them. The flowers come in “blazing” purple, but there are also white and pink varieties.adding spikes of color to the late summer garden. USDA Hardiness Zones 3 - 9. Full sun. It’s easy to see how this plant got its common name. Although the plants can be ephemeral, they bloom for several weeks in the spring and the seed pods hang around long enough to multiply. I’ve found seedlings throughout my yard, so birds or some other animal must help spread them around. Bleeding heart does not like dry heat and the leaves may turn yellow as the plants age. Go ahead and cut them back, if this happens. The roots will be fine and the plants will re-emerge in the spring. USDA Hardiness Zones 2 - 9. Partial shade. It’s an injustice to call this plant a weed, but it certainly does attract butterflies. Bees, too. Because of its long tap root, butterfly weed is very difficult to transplant. That makes its habit of re-seeding all the more appreciated. Be sure to move the plants while they are young, before the tap root develops. Butterfly weed tends to be one of the last plants to emerge in the spring. Be patient. Once it is up it will grow quickly. Columbine bridge the gap between early spring bulbs and the start of prime time in the garden. With a little deadheading they can bloom for weeks at a time. These are vigorous self-sowers, however they also cross pollinate readily. If you are growing more than one color columbine, be prepared to see a blend of colors from the volunteers. You may also start to loose the original colors, so keep them separated if you don’t want this to happen. Although thought of as woodland plants, they are widely adaptable. USDA Hardiness Zones 3 - 9. Full sun to partial shade. False Forget-Me-Not can be a slow grower, especially the newer variegated cultivars. These won’t grow true from seed, but the species, Brunnera macrophylla, with solid green leaves will eventually start spread out by re-seeding themselves. Their vivid blue flowers are a welcome sight in spring. Just be careful to note where they are, because the plain leaves can be indistinct and easily weeded out by accident. Give them a rich, moist soil and they will make themselves at home. USDA Hardiness Zones 3 - 9. Partial shade. Although allr hellebores will self-sow, the Lenten Rose (Helleborus orientalis) does so with abandon. With the hybrids, you never know what you will get. With the species, it is very easy to get a good stand of plants rather quickly. You can let them spread on their own and move the seedlings when they are about 1 year old or you can collect the seed pods and scatter the seeds where you want them. Just be sure to let the pods fully ripen and dry on the plants. USDA Hardiness Zones 4 - 9. Partial to full shade. You don’t find flowers in a more beautiful shade of blue. This is a widely adaptable plant, but all parts of the plant are poisonous if ingested or even if the sap comes in contact with any mucous membrane. Wear gloves when handling it. Allowing the plant to self-sow solves the problem of having to touch it and since the seeds can take more than a year to germinate, it’s easier to let them take care of propagation themselves.